Many different papers with different properties are available today to anyone doing drafting, illustration or other artwork. Unlike acetate, Mylar or other materials, vellum has been in use for centuries. It has some interesting properties that make it a superior choice. It is important to know some of the best uses for vellum paper. One of the best uses for vellum is as a ground for drafting, drawing and other artwork. Vellum produces very different results from the standard paper. Ink lines on vellum have a sharp and crisp appearance that will not bleed out as much as conventional paper. It is also translucent allowing for sharper reproduction. The translucence makes it possible to mount any drawings on different colored backgrounds to create new effects. Vellum can produce some very sharp, detailed and unique drawings. Vellum is an excellent choice when used for masking while creating artwork. The translucency of vellum means that the marks or drawings underneath can be clearly seen through the mask so that it is easier to align the paper correctly. 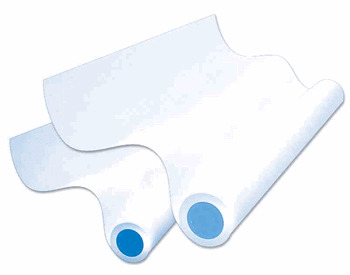 Something that separates vellum from other materials like acetate or Mylar is the absorbency. Vellum will actually absorb a little of the medium placed on top. This will create softer and more natural looking edges. Vellum paper is actually a magnificent choice for certain types of sculpture and three-dimensional pieces of artwork. Vellum has a distinctive texture and a translucency that is hard to find in other materials. It makes an excellent material when creating paper mache sculptures since it can be easily formed into any shape. Vellum is also a practical choice for decoupage since it can enhance or create new layering effects. Vellum can be an invaluable material when creating sculptures or other three-dimensional structures. Vellum is very well suited for use as an overlay when drafting or doing presentations. The paper is far more durable than some other overlay materials that kink or tear easily. An added bonus is that vellum comes in several different levels of transparency. Using vellum as an overlay will make any project or presentation much simpler to create.